Our RV & boat customers love the convenience of our storage facility. Whether you typically travel north or south on I-5 to your favorite weekend vacation spot, Encinitas Self Storage is the right choice for you! We are located on Encinitas Boulevard, just one mile east of the I-5 entrance ramps. Access into our facility is incredibly easy. Our wide concrete aisles give you the peace of mind to maneuver your vehicle safely and easily. Gate access hours are from 7 am until 6:30 pm, Monday through Saturday and from 7 am until 5:30 pm on Sundays. Our parking spots range up to 22 feet in length. Security is a prime reason why customers like to store with us. We have a computerized access gate that protects your vehicle by preventing unauthorized people from accessing the property. At night, electronic beams surround the perimeter of the property. We also have 24-hour video monitoring and a manager who lives on-site. Olivenhain Self Storage, our nearby sister location, can accommodate larger vehicles- even up to 40 feet in length! Come discover why Encinitas Self Storage should be your choice for Leucadia - Encinitas RV & boat storage. 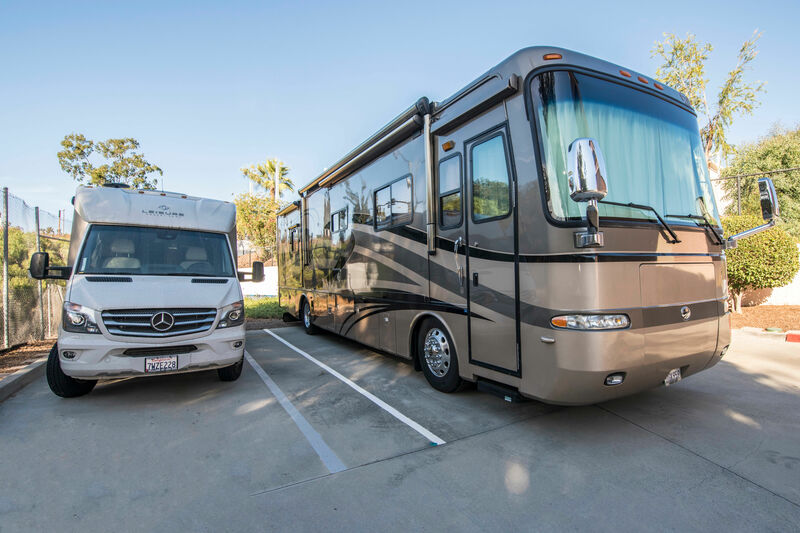 We have the perfect space for your RV & boat!